Just when you thought that zombies could not get creepier or scarier, you see this ghastly thing. The Zombie Clown Mask no doubt ranks high on the list of chilling spectacles, combining the features of a psychotic clown with a zombie. While this clown could have once been quite the jovial entertainer, it is hard to see anything but demented predator now that it has been zombified. 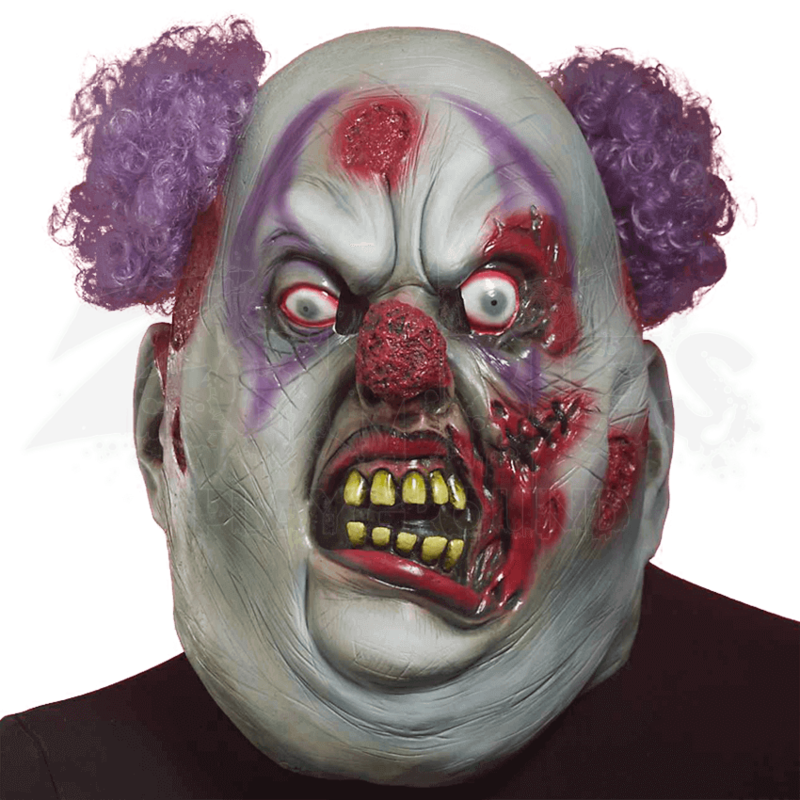 This mask will transform anyone into a painted terror right out of an undead circus. The mask features pallid coloration, like the faded white makeup that a clown would traditionally use, as well as purple highlights painted across the clowns red-rimmed, milky eyes. Small wounds and scrapes expose red tissue underneath the clowns skin. It is mouth is a gruesome growl, revealing yellow teeth and a long cut that has been roughly stitched together at the edge of the clowns mouth. Completing the image are dozens of scratches across the clowns face, as well as a chewed on red nose and two puffs of curly purple hair. Zombies come in all shapes, sizes, and forms, and all of them are terrifying to some extent. Among the most terrifying that any human could ever think to turn themselves into, though, has to be this one with the Zombie Clown Mask.